Beyerdynamic Byron review | What Hi-Fi? Beyerdynamic has a long and illustrious history when it comes to headphones, with its budget and high-end pairs collecting numerous Best Buy accolades over the years. A brand new line of in-ears – the Byrons – emerged in 2017, and at £50 the wired versions had a formidable opponent in the Award-winning SoundMagic E10Cs. The question then was whether the Byrons were worth the extra £10. Since stealing SoundMagic's crown that year, however, the Beyerdynamics' current availability at less than their £50 release price makes them an only more attractive proposition. Beyerdynamic’s long-standing expertise with headphones makes its mark on the Byrons – there’s a level of heft and control to the sound that you don’t tend to hear with budget in-ears. It’s the way they deliver the deep, sludgy guitars in Stone Temple Pilot’s Big Empty; the way they tie all the complex musical strands together in Radiohead’s 15 Step; the way they handle the stop and start of notes with precision and clarity. It’s a mature presentation from in-ears now costing less than £50. The midrange and treble are the highlight here. There’s plenty of headroom for the top end to soar, giving Amanda Palmer’s clear, passionate vocals and the tinkling piano notes in The Bed Song space to flourish. Voices are conveyed with a natural, nuanced touch that leaves you hanging on to every word. There are no hard or bright edges here, but we’d still recommend a day or two’s running in to get the headphones playing their best. After that, you’ll find yourself tapping along to the Hamilton soundtrack, with the melodic hip-hop tracks and rapid fire repartee relying on the headphones’ punctual timing and clear, crisp detail to make an impression. There’s a smoothness to the Byrons that make them easy to listen to over long periods. The rival SoundMagic E10Cs have an appealing upbeat, boppy presentation and less weighty bass, which means the rhythm charges along with a bit more levity. But they aren’t quite as punctual or as revealing as the Beyerdynamics. The E10Cs may have a touch more punch and fluidity, but the Beyerdynamics are far more subtle – you can hear the harmonies surrounding a note, revel in deep, textured basslines that are satisfying to listen to, and get a better sense of the inflections in accents. There’s simply more to hear with the Byrons. Beyerdynamic isn’t one for flashy colours and fancy frills – it has stuck with its classic black-and-metal look, and we can’t fault the Byrons’ sleek, modern appearance. 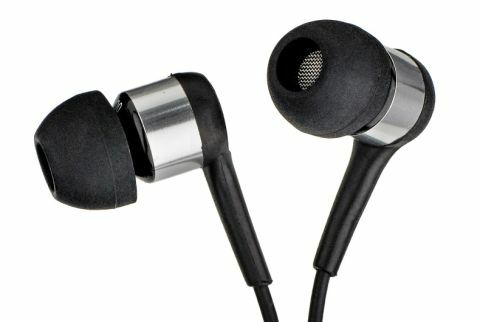 The earbuds are petite and you’ll barely feel them in your ears. There are only three pairs of ear tip sizes included (SoundMagic offers double that), but we did get a satisfactory seal and fit from the choices given. Once in, these in-ears are comfortable to wear for hours. The slim, sturdy cable doesn’t feel flimsy, nor is it prone to twisting or tangling. The standard cable has a three-button remote for playback control and mic for answering calls. It works seamlessly with Android and Apple smartphones alike: playing, pausing and skipping tracks and adjusting the volume is instantly done. You can also store the Byrons in the included soft pouch, which is roomy enough to carry extra ear tips, chargers, cables and more. Handy for travelling. In their various iterations, the SoundMagic E10Cs had been our favourite budget in-ears for five years before the Byrons came along. There had been few contenders to even come close to toppling them from their Award-winning perch. But Beyerdynamic did just that. While some might still prefer SoundMagic’s livelier presentation, the Byrons are simply more revealing and accomplished. The amount of authority, rhythmic precision and subtlety they deliver at this price is superb – and, more than a year and two What Hi-Fi? Awards later, the Byrons remain the budget in-ears to beat.